How did Picasso look at his loved ones? A clue perhaps can be found in Antibes, a city in the South of France. People visiting the French Riviera often take as one of their destinations a visit to Nice, a nice popular resort town for the rich and the not so rich. The view of the beach is breathtaking and the scent of the gentle sea breeze is refreshing, unlike Hong Kong's more humid weather, the South of France is the place to sunbath and to cultivate a better skill on people watching. Those who prefer avoiding the tour groups can choose to visit a nearby small town called Antibes. And the artistic treasure here is the cozy Musee Picasso housed within the stone walls of the Grimaldi Castle, itself an impressive sight, overlooking the waterfront. In 1946, Picasso left Paris for the south of France and spent several months working in what was once the guards' hall of the castle. His materials were what could be found locally during the period of postwar austerity - asbestos cement instead of canvas, boat paint procured from the quayside and household paintbrushes. 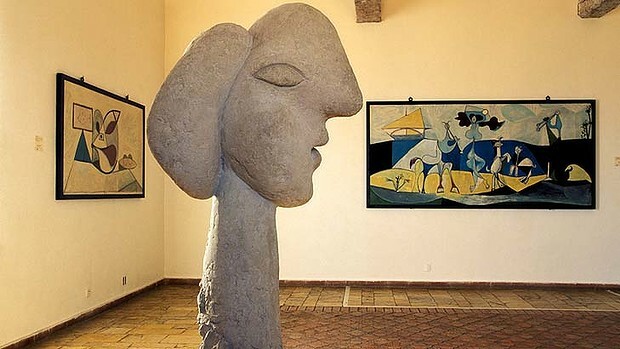 What delighted me most were the large number of sculptural exhibits, giving visitors a renewed insight into understanding Picasso's paintings which were displaying side by side with the sculptures. Some exhibits were generous donations by Picasso's muse and second wife, the late Jacqueline Roque. The world around us becomes meaningful to us through our visual perception. We look at things through a single point of view. With a pair of predator's eyes, the vision of homo sapients is frontal and hence can almost be faithfully captured and transposed onto a two dimensional painting canvas. Most of us find no problem towards this way of perceiving the world, after all, we can move about and enrich our singular images. And we are justified in our complacency. Prominent modern painters, like Picasso, did not like to be constrained by this perceptual rendering on their creation. Different painters used different creative techniques trying to break through this constraint. Moving a bit ahead of my explanation, I find it interesting to see that after a great artist (or a group of great artists of similar orientation) created a new perceptual technique, we can all learn to see the world this way. And for all truthful creativity, it ends up touching our hearts, and we exclaim, "Isn't it the same way of seeing that I have been using in my daily life without my realizing it?" To look at a person or an article we are passionate about, we observe and study it in minute details, from all angles, amidst all moods and in every situation. Looking at one feature attentively, such as a silhouette of a nose, we forget about everything, and even forget about the eyes, the hair, and the mouth. We are consumed by a singular beauty, not only psychological, but, if we think about it carefully, also constrained by the law of physics, the law of selective perception, whose effect will blur our perception of the surrounding. And it is the sum total of these individual perceptions, which are not of the same scale and which cannot be connected together logically in our imagery or memory, that form our total perception of the person or article that we are passionate about. And the stronger our passion, the more images we have and treasure, and the more difficult we can communicate their totality to an unconcerned outsider. Like for a cat lover, every cat is different; but for some (hopefully not too many), a cat is just another cat! Picasso also did sculptures. As you can see from the exhibits in the Antibes Musee Picasso below, Picasso used the same rendering mentality in paintings and sculptures. And you can see his paintings in this regard were richer in meaning than his sculptures. And you can also appreciate his chosen way of artistic creation and communication determined his primary choice of medium - painting. Now that you understand how Picasso looked at his loved ones, do you remember when was the last time you looked at your loved one, the Picasso way? Sabina is a first generation artistic jewelry designer of Hong Kong. She opened her first designer jewelry shop Green G. in Harbour City in 1997 with her husband Paul who still runs the business side of the brand. Her Green G. brand was the first Hong Kong brand to be invited to exhibit in both the Designer Pavilions of the most prestigious Baselworld and Inhorgenta Europe shows in 1983. Besides taking on individual design projects and work directly with her private customers, her jewelries now sell to quality jewelry shops around the world. She shares her views on art and design with her readers in this blog.